Ahijah commissions Jeroboam to rebel and become the future king of Israel. Ahijah HaShiloni, also known as Ahijah the Shilonite, was a prophet of Shiloh (1 Kings 11:29) in the Old Testament. In rabbinical tradition, he is considered one of the longest lived of the prophets and is honored as one of the seven righteous saints whose piety protects the world from destruction. In the Bible, Ahijah is identified as the grandson of Eli, the priest the sacred sanctuary of Shiloh. Ahijah helped King Saul defeat the Philistines by bringing forth the Ark of the Covenant to throw Israel's enemy into panic. According to some authorities, he was later commissioned by King David to oversee the vast treasures dedicated to the Lord (1 Chronicles 26:20—Septuagint version). 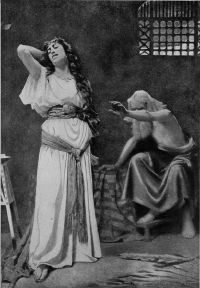 When King Solomon offended the prophetic ideal by erecting altars to non-Israelite gods, Ahijah turned against the house of David and commissioned the northern labor leader Jeroboam to become the future king of Israel, promising him the blessings originally intended for the Davidic kings (1 Kings 11:31-39). Ahijah was thus instrumental in the division of Solomon's domain into the northern Kingdom of Israel and the southern Kingdom of Judah. However, when Jeroboam erected golden bull statues at Dan and Bethel, Ahijah broke with his protegé and predicted God's doom upon his lineage (1 Kings 14:6-16). Despite his initial support of the rebellious king who would go down in history as one of Israel most evil rulers, Jewish tradition holds Ahijah in high esteem, ranking him with saints such as Elijah, Jacob, and Methuselah. Shiloh was a major religious center in Israel during the time of the judges. The Tabernacle was set up at Shiloh semi-permanently during much of the period, and it was here that the Ark of the Covenant was usually housed. At Shiloh, the "whole congregation of Israel assembled" (Joshua 18:1). According to Talmudic sources, the Tabernacle rested at Shiloh for 369 years, although critical scholars doubt it could have been this long. At some point the portable tent seems to have been enclosed within a compound or replaced with a standing structure with "doors" (1 Samuel 3:15) as a precursor to the Temple. The prophet and judge Samuel was raised at the shrine in Shiloh by the high priest Eli, and Ahijah was Eli's grandson. It is likely that Samuel and Ahijah knew each other as children. Ahijah's father and uncle—the priests Phinehas and Hophni—however, were corrupt (1 Samuel 2). Because of this, despite God's strong presence with Samuel at Shiloh, the Israelites suffered two defeats by the Philistines. During the second of these, the sacred Ark of the Covenant was seized. Ahijah's father, Phinehas, was slain, as well as his uncle Hophni. Finally, Ahijah's grandfather Eli died from a fall upon hearing the news (1 Samuel 4). Although the Ark was eventually returned to Israel, it would no longer be housed at Shiloh. Ahijah himself first appears in the narrative among Saul's men as a youth at Gibeah, during a battle against the Philistines. He is already allowed to wear the priestly ephod at this time and has charge of the Ark of the Covenant. Saul commands that Ahijah bring forth the Ark, causing panic in the Philistine camp. The Israelites consequently win a major battle with God's help (1 Samuel 14) through Ahijah's priestly ministry. Ahijah then disappears from the record until the reign of Solomon, with one exception. In the Septuagint version of Chronicles a person named Ahijah is identified as being appointed by King David to supervise the treasures of the house of God and the vast other treasures dedicated to the Lord through David's conquests (1 Chronicles 26:20). If this is our Ahijah—and rabbinical tradition accepts the fact—he was no outsider living at Shiloh, but a trusted and powerful force in Jerusalem. After Solomon took power, the Temple of Jerusalem became the official center of the Israelite religion, replacing both the "house of God" used by David to house the Ark and the local shines and high places, including Shiloh. We cannot say whether Ahijah had a role in the Temple, or even whether he remained in Jerusalem during this time. The spiritual and psychological forces working on Ahijah are thus not specified, except in terms of his future opposition to idolatry. However, it is clear that he eventually grew disillusioned with Solomon's rule. Moreover, despite Solomon's prosperity and skills as an administrator, tensions still existed between the northern tribes, which had been loyal to Saul, and the southern tribe of Judah, loyal to David. Ahijah, too, it should be remembered, served Saul; and Shiloh lay in the area claimed by the northern tribes. David had faced civil war between his forces and those of Saul's son Ish-bosheth in the early days of his reign, followed by a rebellion by his own son Absalom, supported by the northern tribes, and a third revolt led by Sheba son of Bicri, in which "all the men of Israel deserted David to follow Sheba." (2 Samuel 20:2) Ahijah's loyalties are not mentioned during this time, but he must have joined David's administration at some point, if we accept that he was the treasurer of David's sanctuary. Solomon's reign was relatively peaceful, but he imposed forced labor on the northern tribes, increasing the tension between them and the south. Ahijah entered the picture again after Solomon decided to appease his Moabite and Ammonite vassals by erecting altars to their gods near Jerusalem in honor of the princesses that the kings of these nations had offered to Solomon as his wives. This state support of idolatry stimulated Ahijah to act as God's messenger to Jeroboam and ultimately spelled the end of Solomon's united kingdom. 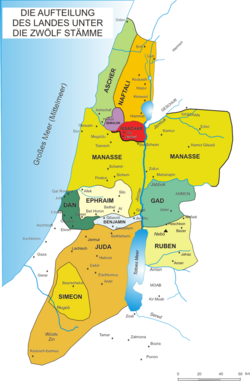 Map shows the position of Ephraim and Manasseh in relation to Judah. Ahijah's home town of Shiloh was located in the territory of Ephraim. While still relatively young, Jeroboam was promoted by King Solomon to be the chief superintendent of forced laborers from the tribe of "Joseph," referring to both Ephraim and Manasseh, working on projects in Jerusalem. 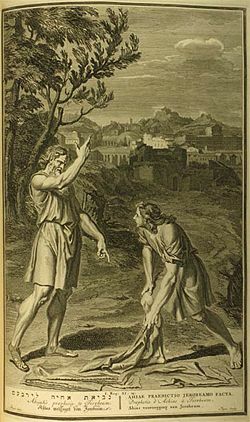 Ahijah, whose long life and Shilonite background would have made him familiar with the region and the people of Ephraim, recognized Jeroboam's potential. Meeting him outside of Jerusalem, he dramatically appointed Jeroboam as the future leader of the Israelite rebellion and God's chosen king. Solomon soon sought to kill the potential rebel, who, with Ahijah's prophetic support, could be a real threat. Jeroboam fled to Egypt (1 Kings 11:29-40), where he remained for a length of time under the protection of Pharaoh Shishak, usually identified with Shoshenq I of Egypt. Ahijah too must have fled the capital although his whereabouts during this time are not specified. "What share do we have in David, what part in Jesse's son? To your tents, O Israel! Look after your own house, O David!" Rehoboam thus abandoned his plans for a full scale invasion. However, there are indications that another factor in Rehoboam's decision was that he had to deal with an attack by Jeroboam's former protector and possible ally, Shishak of Egypt. According to the biblical record, in the fifth year of Rehoboam's reign, Shishak invaded Judah. His campaign was so effective that even Jerusalem, Rehoboam's fortress capital, was taken. The Temple of Jerusalem, some of whose treasures had formerly been supervised by Ahijah, was plundered (1 Kings 14:25-26). Shishak apparently did not attack the northern kingdom, however. Ahijah's prophecy of God's blessing being transferred from the house of David to that of Jeroboam showed every likelihood of being fulfilled. Jeroboam, however, had made a fatal decision. In an effort to provide an alternative place of pilgrimage for Israelites who formerly offered their tithes and sacrifices in Jerusalem, he established national shrines at Bethel and Dan (1 Kings 12 26-32). Ahijah's home shrine at Shiloh was located only a short distance from Bethel. The choice of Bethel rather than Shiloh may thus have been a factor in Ahijah's disapproval. However, the biblical narrative states that the direct cause of God's rejection of Jeroboam was his erecting a golden (or bronze) bull-calf statue at each of these new national shrines. In addition, Jeroboam appointed priests at these and other hilltop shrines who, unlike Ahijah, were non-Levites. These acts earned Jeroboam the lasting enmity of the religious establishment at Jerusalem and turned Ahijah against him as well. Ahijah's dire prophecy to Jeroboam's wife. I raised you up from among the people and made you a leader over my people Israel. I tore the kingdom away from the house of David and gave it to you, but... you have provoked me to anger and thrust me behind your back. Because of this, I am going to bring disaster on the house of Jeroboam. I will cut off from Jeroboam every last male in Israel—slave or free. Ahijah added that as soon as Jeroboam's wife returned home, her son would die. Jeroboam was succeeded by his surviving son, Nadab, who was killed in a coup by the usurper Baasha of the tribe of Issachar. Baasha killed Jeroboam's whole family after taking power, thus fulfilling the prophecy of Ahijah years earlier. The Midrash confirms that Ahijah was Eli's grandson, basing itself on the fact that Ahijah was extremely aged in Jeroboam's time (1 Kings, 14:4). He is singled out by rabbinical tradition as one of the seven long-lived righteous men (tzadikim) whose successive lives extend over the whole history of mankind, shielding the generations of their time by means of their piety. The traditional list of these saints includes: 1) Adam, 2) Methuselah, 3) Shem 4) Jacob 5) Serah, the daughter of Asher; or Amram, the father of Moses, 6) Ahijah of Shiloh, and 7) Elijah the prophet. Ahijah is said to have lived over 600 years, having received his wisdom from either Amram or from Serah. The rabbis also consider Ahijah of Shiloh to be the same as "Ahijah the Levite," who, according the Septuagint version of the Bible, was placed by King David in charge of the treasures dedicated to Yahweh (1 Chron. 26:20; see B. B. 121b, Rashi). According to 2 Chron. 9:29, one of the histories of Solomon's reign (now lost) was written by him. Ahijah supported the future evil king Jeroboam because the latter had shown great wisdom and learning. He excelled all the rest of Ahijah's pupils and had been initiated into the innermost secrets of the Torah (Sanh. 101b et seq.). Another tradition holds that Ahijah's blindness in his old age (1 Kings, 14:4) implies spiritual blindness (Gen. R. lxv.). Some hold that Ahijah was stricken with the plague after Jeroboam's apostasy (Gen. R. lxv., Yer. Yeb. xvi. 15c). Maimonides, in his introduction to "Yad ha-ḤazaḲah," says: "Ahijah was a Levite, a disciple of Moses... and also a disciple of David; and finally he became the teacher of Elijah before his death." In the documentary hypothesis of Old Testament biblical criticism, the "E" or Elohist source is often thought to have originated with the levitical priests of Shiloh, who did not share the Aaronic priesthood and were thus placed in a subordinate position to the leading priests of Jerusalem. Ahijah was one of these Shilonite priests and is identified as writing a history of Solomon's reign. Since few Shilonite priests are known by name, he thus makes an intriguing candidate as one of the "E" writers, especially given his identification as a writer of a history of Solomon. 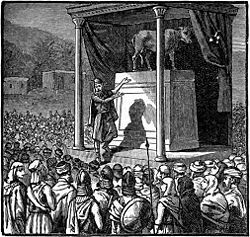 It is also noteworthy that in his recorded prophecy, Ahijah denounces Israel for its idolatry and the making of Asherah poles, but does not specifically mention the bull calves or the shrines at Dan and Bethel, as is often the case in other references to Jeroboam in the Book of Kings. Even the most adamantly pro-Yahweh northern leaders—Elijah, Elisha, and King Jehu—never moved to reform or destroy these shrines, although these men acted with utter violence against Baal and Asherah worship. Bull worship had long been associated with the Canaanite god El, who was also worshiped by the Israelites and came to be identified with Yahweh. Could it be that Ahijah himself opposed Jeroboam for other reasons than the "golden calf" worship of which the biblical writers are so critical? Despite making a king of the infamous Jeroboam, Ahijah left a unique legacy of devotion to God. As a boy, he lost his father, uncle, and grandfather on the dark day that the Philistines captured the Ark of the Covenant and brought an end to Shiloh's long-standing prominence during the period of judges. Later, once the Ark had been returned to Israel, Ahijah cared for it and brought it forth to confound the Philistines. He became King David's sacred treasurer and reportedly wrote a history of King Solomon, now tragically lost. When Solomon fell into idolatry, God used Ahijah to appoint Jeroboam to be the northern king, promising great blessings. Tragically, Jeroboam led the northern nation astray, bringing about Ahijah's prophecy of doom. Through it all, Ahijah stood as a beacon of faithfulness when all those around him missed the mark. Though little remembered in Christian tradition due to the sparse tracks he left in the biblical record, rabbinical literature rightly remembers him as one of the truly righteous ones. ↑ Zevachim 118B www.mechon-mamre.org. Retrieved May 10, 2008. This page was last modified on 9 February 2019, at 16:41.